1 There's no denying that Maja Salvador is one classy lady. In an interview with PEP, Maja addressed ex-boyfriend Gerald Anderson's blossoming relationship with Bea Alonzo, who happens to be her good friend. When asked about it, Maja said, "Kay Gerald, syempre ang pangit naman kung sasabihin ko, 'We're friends.' Napaka-showbiz na sagot n'un. [We're] civil...Kay Bea, friends talaga. Alam kong mahirap intindihin...pero sobrang klaro sa akin at sa puso ko na over na ako sa relationship namin ni Ge and if 'yung kaibigan ko is happy with him, happy kung meron man silang relationship or still dating, go lang. Hindi ako hahadlang kung masaya 'yung kaibigan ko." Maja added, "Isa pa, nauna naman 'yung Bea-Gerald talaga noon, 'di ba?" Towards the end of the interview, Maja says she really just wants happiness for both Bea and Gerald: "Sobrang gusto kong maging masaya [si Bea] at sana si Ge na talaga magpapasaya [sa kanya.]" 2 Things got a little messy between Daniel Matsunaga and Erich Gonzales after they broke up, but it looks like they're finally ready to move on. The two briefly reconciled for a concert in the U.S. According to makeup artist and DanRich's close friend RB Changco, "[w]hat happened in the US is a request from the producers of their show and to give appreciation [to] those who have supported them." 3 If you want to channel your inner Liza Soberano without going totally broke, the Samsung Galaxy J2 Prime is for you! It comes with an 8mp + 5mp camera with front flash. Premium selfies, anyone? ;) Only P5,990! 5 Your childhood fave is calling! 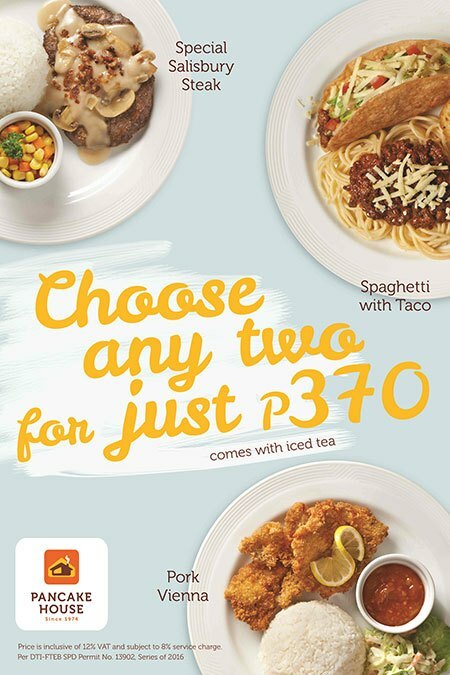 Pancake House's "Choose Any Two for only P370" promo is back! The promo is only until February 28 so grab your BFF or work wife and indulge!